It was just like any ordinary morning. Well, I thought so, that is until I got up and looked in the mirror. But let’s start at the beginning. The ring of the alarm clock jarred me into wakefulness. I reached out and pressed the off switch. Where’s the night gone? I thought, as I heaved myself into an upright position and swung my legs over the side of the bed. I pulled an assortment of clothes from my wardrobe and laid them on the bed before going to the bathroom. The warm water of the shower had done its job and I felt at last fully awake. 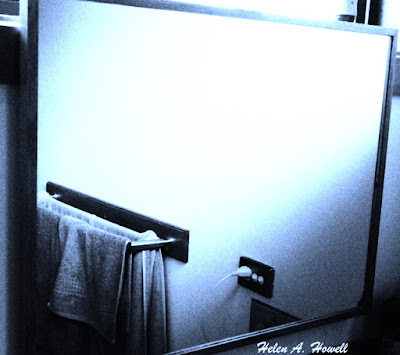 Wrapped in a soft towel I leaned towards the mirror that hung above the sink and wiped away with my hand, the steam that covered it like a fine silk web. The eyes that stared back at me were mine and yet they weren’t. My heart jumped as I took a step back. The mirror quickly steamed over again. For a moment I couldn’t think, then my common sense clocked in. It’s a trick of the light, what else could it be? I told myself. I dried off my damp hair with the towel and went back to the bedroom to get dressed. I knew I would have to return to the bathroom to use the hairdryer, but deep inside I was afraid. Of what I don’t know. My gut instinct told me not to look in the mirror again, but I ignored it as a figment of my imagination. I took my time getting dressed. I glanced at the clock and knew if I didn’t get a move on I would be late for work. I grabbed the hairdryer from its shelf in my wardrobe and walked back to the bathroom. The mirror was still steamed up and so I plugged in the dryer and pointed it towards the glass. The mist evaporated from the warm heat. I began to dry off my hair, brushing it this way and that and somehow avoided looking into the glass. I hung my head down and gave my hair one last long blast before standing up and looking straight into the mirror. My reflection stared back at me. It was me, but it wasn’t. Same face, different colour hair, different colour eyes and different outfit. My heart banged in my chest and for a second I thought I might faint but the moment passed and the colour returned to my cheeks. I raised a hand and so did my reflection. How is it possible that what I’m looking at has different coloured hair, eyes and a different set of clothes on? Am I dreaming? I pinched myself hard on the arm, “Ouch,” I certainly wasn’t dreaming. I leaned in and so did my reflection. The whole thing was unfathomable and unsettling. I told myself it must be an illusion and turned to walk away but before I did I took one more glance over my shoulder at the mirror. Nifty! Is this a portal? Winking is not the worst that could happen in that scenario! I really hope they get to talk. Looking forward to the next chapter. There's more coming, right? This is a great setup. Whoa, that would be super unsettling! Yes I imagine it would. Thanks for reading Icy now all I have to do is get around to writing part 2 but time keeps escaping me.